The day started off similar to yesterday although slightly chillier. 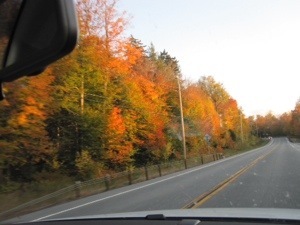 Having prepared ourselves by eating a simple porridge breakfast and getting a prepared salad for our lunch, we set off to explore the Adirondacks a little more by car. We headed off in the direction of the Blue Mountain Lake. 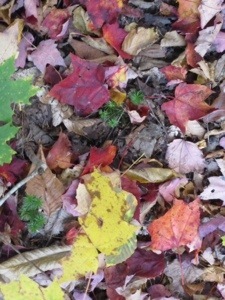 The colours continued to be magnificent and eventually the clouds cleared to give us the sun. We drove slowly to get as many impressions in as possible. As the morning wore on and the sun stayed out, it got increasingly warmer. It was beautiful. Before leaving Old Forge, we went to look at the Adirondacks National Exhibition of American Watercolours. Apparently this is an annual event. I was unclear as to whether the exhibitors were meant to be from the Adirondacks, or whether the scenes were meant to have an impression of the Adirondacks, as I understand the artists were from all over the US and watercolour seemed to include Acrylic, Gouache, pen &link as well as traditional watercolour. The subjects of the pictures were from many places, also external to the US. We had proudly been advised by locals that the exhibition demonstrated for everyone that there was a lot of very good art in the Adirondacks. This exhibition certainly did have quite a lot of good art, but as is the case everywhere, some of its quality is in the eye of the beholder. I can only say, thank goodness to that, as I know not everyone appreciates botanical art. I’m of course glad that some do. This photo was taken as we came out of the exhibition. The centre itself was very impressive and worked really well in exhibiting artwork. 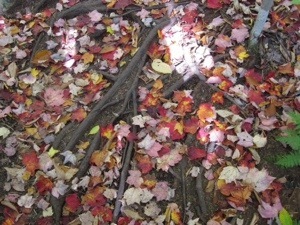 We carried on up to Blue Mountain Lake, intending to go into a museum there. However, the entry fee was a lot more than we wanted to pay for only having a quick look, rather than dedicating the day to taking in the history of the Adirondacks. This is the view we had whilst eating our lunch. Today the wind was up and there were waves on all the lakes we passed. Yesterday, everything had been wind-still. 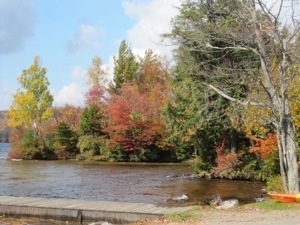 We had thought about making our way up to Lake Placid and the High Peaks, before wending our way back to Old Forge. But we dropped in at a place calling itself ‘The Trading Post’ to get a cup of coffee. During the conversation, we mentioned what we had intended, the lady there came after us as we were leaving saying we ought to change our minds and do something else. She suggested that a few miles along the road there was a track leading up Coney Mountain, with fantastic views on the top. Of course, as you realise, we have been very obedient to the advice we have been given along the way and have actually done some fantastic things we might not have done otherwise. Although not really clad for the hike, we had fairly strong sandals and some water, so found the track and did as we were told. What can I say! If a local gives advice and your gut feeling is in rhythms with it, go for it! 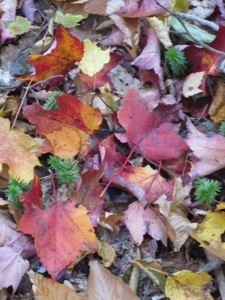 Look at the colour of these leaves, and they are on the ground! On the way up, we met three pleasant couples. One couple in particular were really helpful and if they read this, thank you. We explained that we were taking this trail on the spur of the moment and were not really prepared. They had some written information about the climb and what we would see on the top. They gave it to us and it made everything so much more interesting in knowing what we were actually seeing. I had filmed a video that I had intended including in this blog. Unfortunately it won’t download for some reason, so I can’t include it. Still it was a fantastic 360 degree view of the Adirodacks, with the high peaks in the distance. We may not have gone to Lake Placid, but we had a rough idea of its position from our viewpoint on Coney mountain. 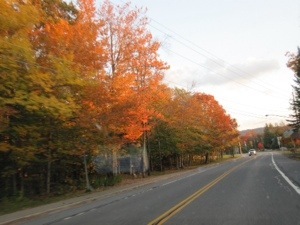 However, I will include a few more pictures of our return journey down the mountain and on our way back to Old Forge. The crickets continue to rub their legs together!